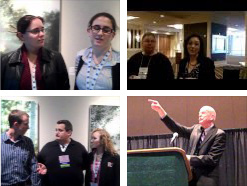 New videos from the Annual Meeting in Phoenix continue to be posted on the AMS YouTube channel. So far you’ll find interviews with new AMS Fellow Jack Williams, on weather in the media; AMS Associate Executive Director William Hooke, on the state of the weather, water, and climate community; and UCAR President Tom Bogdan, on space weather science developments at the meeting this week. More interviews with you and your colleagues, from poster sessions to hallway conversations, will be appearing on the channel throughout the meeting, so keep talking!